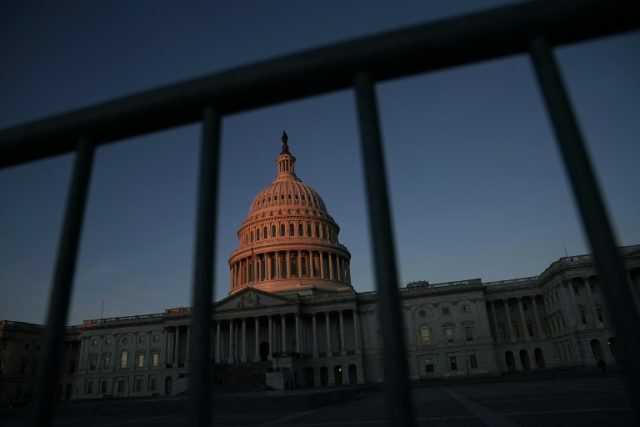 Washington (AFP) – US lawmakers failed to reach an agreement Sunday on ending a government shutdown before the start of the working week as they postponed a crunch vote in the Senate despite marathon negotiations. Although leaders of President Donald Trump’s Republican party and the opposition Democrats said progress had been made in a weekend of talks, they pushed back a vote scheduled for 1:00 am (0600 GMT) Monday for another 11 hours. The delay means the shutdown — which cast a huge shadow over the first anniversary of Trump’s inauguration as president on Saturday — will force hundreds of thousands of federal government workers to stay at home without pay when they would normally report for duty on Monday morning. After a special weekend session of Congress which had seen bitter recriminations traded by both parties, Senate Majority Leader Mitch McConnell pledged to address Democrat concerns over key issues such as immigration reform in a speech to the chamber late Sunday. McConnell then called for Congress to reconvene for another vote on a stop-gap funding measure at noon, a proposal which was nodded through. Hopes that the shutdown, which began at midnight on Friday, could be limited to the weekend had been raised in the afternoon when a bipartisan group huddled for hours on trying to end the standoff but they ultimately failed to resolve all their differences. Trump early Sunday encouraged the Senate’s Republican leaders to invoke the “nuclear option” — a procedural maneuver to change the chamber’s rules to allow passage of a budget by a simple majority of 51 votes to end the shutdown. White House press secretary Sarah Sanders said Trump had spoken during the day with McConnell and Senate Majority Whip John Cornyn. She did not mention Trump’s speaking with any Democrats but said White House director of legislative affairs Marc Short had been in touch with members of both parties and updated the president. “We are continuing to work hard towards reopening the government,” she said. At the heart of the dispute is the issue of undocumented immigration. Democrats have accused Republicans of poisoning chances of a deal and pandering to Trump’s populist base by refusing to back a program that protects an estimated 700,000 “Dreamers” — undocumented immigrants who arrived as children — from deportation. “We’re just in a holding pattern. We just have to wait and see. It’s scary,” Noelle Joll, 50, a furloughed US government employee, told AFP in Washington. New York Governor Andrew Cuomo, a Democrat, said that state funding would pay for the reopening Monday of the Statue of Liberty, which was among facilities affected by the shutdown. Republicans have just a one-seat majority in the Senate, and therefore have to lure some Democrats to their side to get a 60-vote supermajority to bring the stop-gap funding motion forward. Highlighting the deep political polarization, crowds estimated in the hundreds of thousands marched through major US cities on Saturday against the president and his policies and express support for women’s rights.